Strong are bonds of friendship forged in dance class and it was such a joy on my most recent trip home to the True North Strong and Free, to reconnect with a friend in our natural habitat: a dance studio. At La Girandole dance studio, in Edmonton’s La Cité Francophone, my sister and I partook in BooTy®, a class that combines “music, movement, fitness and yoga” in a fun, supportive, non-judgmental workout environment, led by my great friend Karen Zimmerman. Karen and I met in a dance class in 2005, when we were both students and members of Orchesis, the University of Alberta’s Modern Dance Group. Over the years, we’ve danced through many Orchesis Motifs and closing night parties, summer jazz classes, post-Oilers victories and defeats at the bar (Karen’s then-boyfriend, now- husband, David, taught me how to two-step during the Oilers playoff run in 2006), each other’s dance-themed stagettes, and our weddings. The natural next step – pun intended – has been both of our journeys into teaching dance, as well as continuing to shake it ourselves. EM: How did you find out about BooTy® and the teacher training? KZ: One of my cousins is a BooTy® Leader (we prefer to call ourselves ‘leaders’, rather than teachers) in Stettler and she encouraged me to come to her class. I really enjoyed it and not long after, I met Tara [Newbigging, the creator of BooTy®] when she led a workshop in Stettler. I actually only took two classes before I took the Leader Training. EM: What drew you to the program? KZ: It’s really fun and the class atmosphere is great! I hate working out in a gym; I prefer to take classes, like dance or yoga. I’ve tried barre fitness and I enjoyed it, but there’s something much more freeing about BooTy®, in my opinion, since it’s more choreography-based. I’ve been a trained dancer since I was three years old, so finding this dance-cardio class just felt like a perfect fit. It just feels like I’m dancing but I happen to be working out as well! EM: I also prefer to take classes, rather than straight-up work out. Way more fun and I agree, a great class atmosphere is key. How would you describe the atmosphere of BooTy®? KZ: It’s all about creating a sense of community: a supportive, non-judgmental environment where women can just let go and have fun while moving. For the physical atmosphere, I prefer soft lighting to harsh florescent lights, because it helps everyone feel more comfortable in front of the dance studio mirrors, and I turn the music up loud so we can really let it go. It’s a safe space to move and sweat and have fun. EM: Before becoming a BooTy® Leader, had you ever taught dance before? KZ: Not really, but I’m a former tour guide from the Alberta Legislature, so I’m used to public speaking and I feel pretty comfortable in front of people. EM: How would you describe the style of BooTy® class? KZ: It’s a little bit of everything: dance, yoga, really just movement set to music with a cardio element. We use a playlist of 200 songs and the music really drives the flow. The songs are meant to be empowering and inspiring, to really make women feel good. We also put a lot of emphasis on the Shavasna [the corpse/resting pose] portion at the end of class. We set it to a powerful/meaningful song that the ladies can take in and release tension. The choreography element, I think, is really great for building a mind-body connection because you do have to think in order to follow along with the movement, but there’s no judgment when you don’t get it perfectly. Dance stimulates different parts of the brain, so it’s a mental workout too. EM: What do you find the most rewarding about BooTy®? KZ: Definitely getting to meet the women who come out to class. BooTy® attracts the kindest, most incredible women of different ages and backgrounds. We’re creating new friendships, we’re starting to go out after class and to get to know each other outside of class. It’s so great too, while in class, when I see how hard they’re working, how they keep going when they make mistakes, and how much fun they’re having. The people are the best part for sure. EM: What would you say to encourage someone, a first-timer, maybe someone who doesn’t have a lot or any dance experience, to give BooTy® a shot? KZ: I would just say, just come and try it out; it’s such a supportive, encouraging, non-judgmental class. It’s amazing to see women trying something and getting better. You’ve got this! I couldn’t agree more. Plus, the first class is FREE! You have nothing to lose, so go for it. You’ve definitely got this. I should add, as the photo clearly indicates, that I was 24 weeks pregnant when I took the class (our baby is due anytime now!) and though I had to make a few modifications to the choreography (no burpees for me! ), my heart was pumping and I got my sweat on. The next day was all ‘Hello Calf Muscles and Quads! It’s been awhile!’ To me, that’s one of the marks of a great dance workout: fun, challenging and leaves you feeling it a bit the next day. 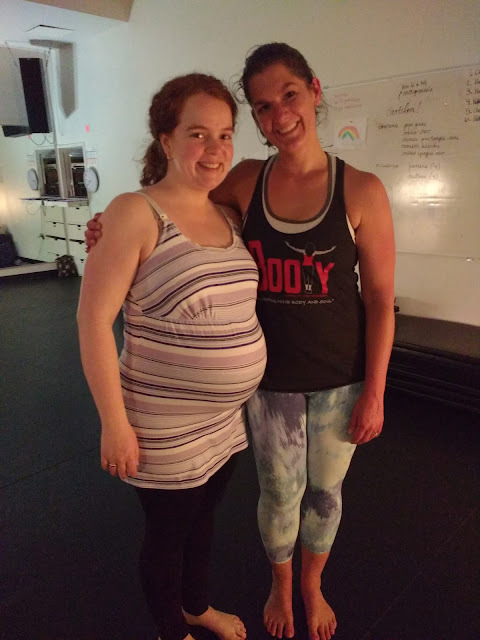 I stand by my previous disclaimer regarding dancing/working out while pregnant – I’m not a healthcare professional, I checked with my midwife, I know my body and I didn’t push myself beyond what I knew I could do safely – and I strongly encourage any mamas-to-be to check with their doctors regarding safe exercise practices. You can also find info regarding BooTy® in Edmonton on Facebook: BooTy® Edmonton.